2. The fact that it is reversible to solid black material is great. I wore it robbing a bank the other day, I reversed it and the cops had no idea it was me. They were looking for someone in a spiderweb face mask but I was now in what appeared to be a black face mask. 3. The vent Holes at Ear and Mouth is a must have. After all, breathing is pretty cool. 1. Now that my wife has kicked me out of the house and I'm living on my motorcycle, I have really noticed the need for more ventilation. I haven't showered in six months and my Glow in the Dark Spiderwebs Neoprene Face Mask is pretty ripe smelling. 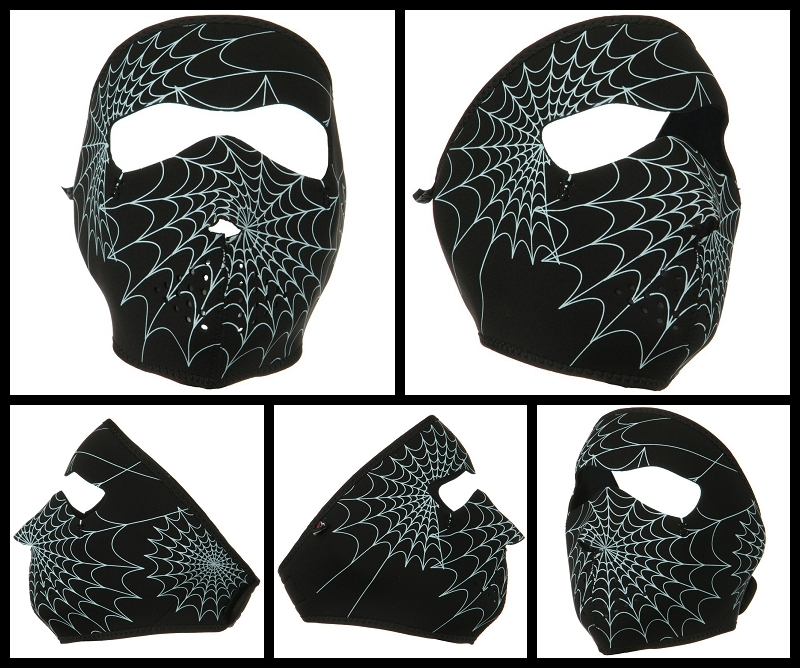 All in all I would buy this Glow in the Dark Spiderwebs Neoprene Face Mask again, and definitely recommend it to my friends (that live in a different state than I do). Awesome Neoprene Face Mask from www.ironhorsehelmets.com.